﻿ Выставка живописи и фотографии "О России и Москве"
Среди прочих работ, выставленных в Малахитовом зале, есть и фотографии, сделанные Мехди Эбрагими Вафа. Приглашаем всех желающих посетить выставку с 1 сентября до 30 сентября 2016 г. 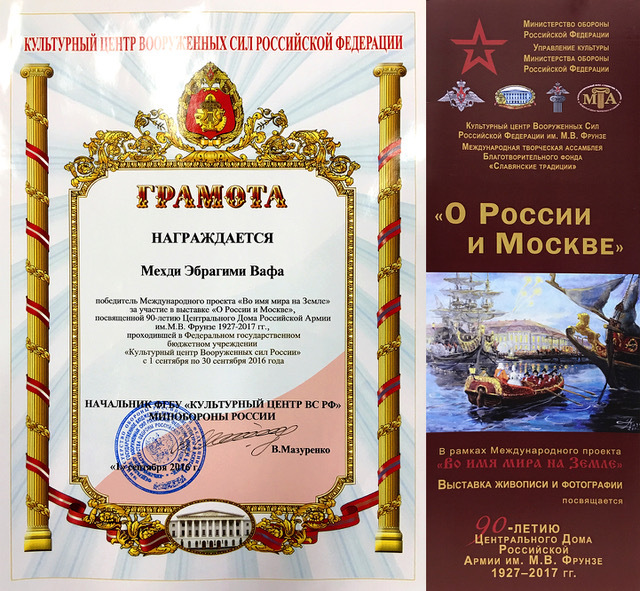 My friends, an exhibition of paintings and photos «About Russia and Moscow» takes place in the framework of the international project «For the sake of peace on the Earth» in the Cultural Center of the Russian Federation Armed Forces named after M.V. Frunze. It is dedicated to the 90th anniversary of the Central House of the Russian Army named after M.V. Frunze (1927-2017). Among the other works there is a photo taken by Mehdi Ebrahimi Vafa on display in the Malachite Hall. We invite everyone to visit the exhibition on 1st-30th September.